When I create a new page using the existing page types present in DXA 1.2 the components still get created in 400 Example Site Publication instead of getting created in 100 Master publication. I have already updated the blueprint context settings please find below the screenshot of the same. Am I missing some step here ? Just checked the \400 Example Site\Building Blocks\Content\_Cloneable Content content, actually Article Component attached on the Page type is created itself in 400 Example Site. so you will get your new page's component created in 400 only. if you create this component in master, you will get desired results. In DXA 1.2, the OOTB Page Types and Content Types are defined in the 400 Example Site. 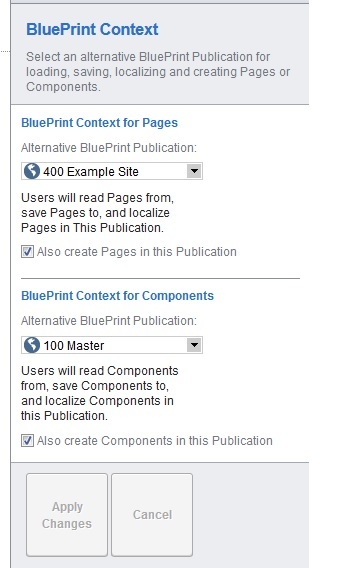 XPM doesn't allow you to create the Pages/Components higher in the BluePrint than where the Page/Component Types are defined. In DXA 1.3, the Page/Content Types are defined higher up in the BluePrint (in a new Site Type Publication), which makes them re-usable and also allows you to create the Pages/Components higher up in the BluePrint. Not the answer you're looking for? Browse other questions tagged experience-manager dxa 2013-sp1 dxa-1.2 or ask your own question. DXA 1.5 compatible with 2013 SP1? Is there a supported way to split up the DXA Master publication in a schema and template publication?